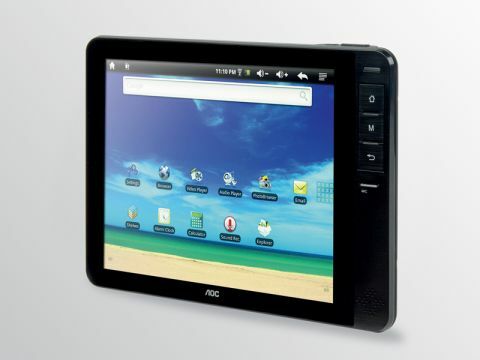 AOC is arguably best known for manufacturing LCD monitors and the Breeze is its first tablet release. While there's plenty to commend considering the low price, its awful screen ruins much of the good work. The tablet is well built, with a rubbery back plate that's both comfortable to hold and durable. The front plate, surrounding the 8-inch touchscreen, is plastic but features a mock brushed aluminium finish that adds a touch of class. Showing its budget roots the Breeze runs Android 2.1, an outdated version of Google's operating system that, for example, isn't compatible with Adobe Flash content. This means you can't watch video on the internet via sutes such as YouTube. It's commendable that AOC hasn't crammed hundreds of unwelcome apps into the Breeze, but a few useful ones, such as an ebook reader, have been included. Even more impressively for the price, Android's Market app store is included. This lets you download quality apps from the huge library so you can quickly access the latest software. Unfortunately the low-powered processor means you can't play games very well, with a lot of lag evident when we tried. Most apps downloaded run smoothly enough, but resource intensive activity of any kind drags the Breeze to an almost standstill. This won't be a problem if you're only interested in browsing the web or reading an eBook, however. The 4GB of storage is a little limiting, and the chances are you'll want to take advantage of the Micro SD card slot and expand your storage options. Connectivity is average, but that's to be expected for the price. 802.11g Wi-Fi doesn't offer the fastest wireless networking around, but we found the internet to run smoothly and at speed in good signal. There's both a micro-USB and standard USB port for connecting to a laptop or attaching peripherals. Up to this point the Breeze is actually not bad considering the price, but the screen puts a real damper on things. It uses resistive screen technology and is extremely unresponsive to finger inputs, making interacting with the device often frustrating and occasionally a nightmare. It'll interpret prods fine, so using the on-screen keyboard isn't a problem, but swipes and flicks rarely get registered the fifth time, let alone the first. The 800 x 600 pixel resolution is also surprisingly blurred, and colour reproduction also disappoints making this tablet unsuitable for viewing media on. It's a shame because, for a budget device, the Breeze shows quite a bit of promise, but the poor touchscreen really does ruin the party.